These lengths of moulding were first painted black before being French polished with black shellac to build up a rich black lacquer. Shellac is a resin secreted by scale insects (Laccifer Lacca) which they extrude from their host tree. The resin is dissolved in alchohol to provide a golden brown lacquer. It is applied with a rubber made from a wad of cotton wool soaked in shellac and held in a piece of lint-free cloth. 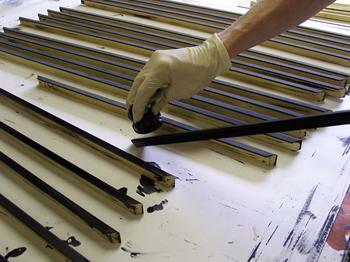 The rubber is squeezed gently as it is stroked repeatedly over the moulding to build up a richly polished surface.